Hi all, Craig here again. I’ve posted a few times on my own blog, Entertaining Stories, about how I’ve benefitted from a semi-obscure media called Flipboard. Flipboard is one of those curated content setups, and I came to it by accident. Once upon a time, I had a Zite Magazine account. I set it up to be a source of ideas that I might want to write about. All was well with the world, because I could give a thumbs up or down and improve the stories I got. I set up all kinds of things, like archaeology, paranormal, scientific discoveries, and more. Many of these made it into posts I make called The Idea Mill. Then Zite got absorbed by Flipboard. I didn’t have any choice but to switch over. Honestly, it doesn’t work quite as well for my original purpose, but it allows me something I never expected. It allows me to establish my own magazine, and add articles of my choosing to it. People can subscribe to my magazine, and “flip” my posts to their own friends and followers. I set up a magazine called Entertaining Stories. (‘Cause branding, that’s why.) I started dropping my blog posts, along with some news from friends, and artwork of my spokesmodel, Lisa Burton into my magazine. (More on Lisa later on.) It takes about two seconds to drop a link into Flipboard, and they take care of the rest. Couldn’t hurt, might help, right? One day I wrote a post about a Short Story writing trick. All of the similar articles I’d read didn’t do much more than tell me to make them shorter than a novel. I had a different spin on it, so I wrote it up. I dropped it in Flipboard. When I woke up the next day, my blog stats were off the chart. I’m talking about well over a thousand views overnight. This may not be much to some of you, but it’s huge for me. This screenshot was taken on January 17th. I’ve already had one post get action on Flipboard, and if you can’t read the tiny little number, that’s 1058 referrals. Here are the 2016 numbers. It says 5,219 referrals. You’d be right if you guessed that not every post clicks with the Flipboard crowd. Enough of them do to make it worth your while. None of my posts that caught on produced less than 1000 referrals. To help me explain how to set this up, I’ve invited the lovely Lisa Burton to help me out. Lisa is a robot, and works as my personal assistant and is the spokesmodel for my writing career. Your first step is to go to Flipboard.com. You can sign up right there, or if you’re like me, grab the app. I do all of my blogging, writing, and promoting with an iPad Pro, and the app is the way to go for me. Like everything else these days, you’re going to have to sign up and sign in. Flipboard may make you “flip” the cover page to get to the good parts. This involves a finger flick for me, and likely works that way on all devices. You’re on your own with a PC, but it probably involves a click of some kind. When you get inside, it gives you a couple of starting points, like Cover Stories, The Daily Edition, and Flipboard Picks. If you want to check them out, just pick one and flip. You can give articles a thumb up or down to fine tune your content. I’ve added several pages of specific searches to mine, and you can customize it to suit yourself. It still gives me some of the material I used to get from Zite, and you can see that I have Paranormal, Fantasy, and others in this screenshot. To set up searches, you need that little red flag in the upper right hand corner. Knock yourself out. That red flag will show you that you have two magazines already. I’ve never looked inside either one. This is where you set up your own specific magazine. Like I mentioned way back up the page, mine is called Entertaining Stories. The only thing that goes in there is content that I choose. When I find content for my magazine, I copy the link. As soon as I open my app, Flipboard asks me if I want to paste the link into a magazine. I touch that alert banner, and it gives me a choice of which magazine to post it in. I always add it to Entertaining Stories. Now my content is discoverable on Flipboard for other users. My short story trick, my 2017 business plan, and several others caught on. This drives people directly to my blog. From there, interested parties can find my books. I gain quite a few blog followers every time Flipboard kicks in too, and that’s what it’s all about. Flipboard is a way to get discovered. My blog is the engine that drives my promotional activity. Followers can become consumers, and that’s why I do these things. I wouldn’t be at all surprised if this post gets some Flipboard action too. I posted about the boost in blog stats last year, and that was one of the posts that went crazy. Check out Flipboard. It’s performed about as well as anything I’ve tried, and even though it’s sporadic it’s well worth it when it works. Let me hear from you in the comments. Do you use Flipboard, or have any tips to share with us. Do you prefer another kind of curated content, share it with us. Footnote: Lisa Burton is a robot. She appears in two published stories, and makes regular appearances on my blog. She hosts a radio show where she interviews fictional characters from your books, and makes occasional appearances as a guest on other blogs. Over here from Chris, The Story Reading Ape’s blog. So pleased to read this great article about Flipboard, Craig. I joined up last year but then forgot about it. Then, a few days ago, my stats went crazy and Flipboard was the reason. I took more interest, found out how to create a Flipboard sharing button for WordPress (as they don’t have one) and was then contacted by the folk at Flipboard who thanked me for writing a post about that share button and asked if they could help with anything else. They sent me some links on how to use Flipboard, and I’m now hooked. That’s wonderful, thank you. I had someone walk me through the button myself. It doesn’t seem as functional on an iPad, so I use the app to post. The button may help my friends with PCs though, so I leave it up. I use it mainly on my iMac, although I do love the way the pages flip on the App (which they don’t on a desktop). I’ve still lots to learn about it but am enjoying the experience. Wow. Bookmarking this puppy. Thanks, Craig! Glad you got something out of it. I’ve never heard of flipboard, Craig, but you’ve got me intrigued. I’ll have to give it try later in the week when I have more time. I think it’s worth looking into. Let me know if you do. I’ve bookmarked the site, Craig and I rarely do that, so it’s a good start. I just started on Flipboard last weekend. It’s very cool! Do people find you through tags that flipboard gives you? One of my posts is about seeing celebrities and how it changed me. Flipboard put it under “babies.” How do I change that? I think Flipboard picks their own. I’ve never entered specific tags. I have them on my blog, and assumed they transferred over. Fancy way of saying that I don’t know. Ha! Oh, well. Thanks for the info! I have no idea how it picked babies when I had celebrities throughout the post. Weird! Check out this information on Flipboard from the Story Empire blog. Enjoy it, and thanks for commenting. Out of interest, Craig, do you know pinrss at all? Keep getting referrals from them, though I’ve never signed up to them. They collect links to blogs and sites, but not sure how they found me, not that I’m complaining – getting a steady trickle of views through them. Interesting, I’ve never heard of them. I’ll check it out. Thanks for sharing. It has similarities to Pinterest, only it’s more for content than graphics. Maybe it will work for you. Some great insight into Flipboard from Craig Boyack – well worth a read! It’s a great post, Craig – thank you for sharing your knowledge, really useful stuff! Glad you enjoyed it. I find something decent every once in a while. This is great information, Craig, and very timely, as I’ve been thinking of giving Flipboard a go.Thanks so much for sharing your insights! Try it out. I like something that requires a bit less hand holding. I’m going to give it a try, definitely! How Interesting! It’s amazing what clicks with certain audiences, and I can see that your craft posts certainly would find the right group. Excellent information. I’ll check out flipboard further.Thank you. It’s a nice interface, and people can surf through articles rapidly. It might be something you find useful. What great results, Craig! Must give it a go! Doesn’t sound too difficult and could be fun. Sounds a bit like Stumbleupon. It is a bit like Stumbleupon. For some reason, I stopped getting results from them. I still upload links, but I think the app and the website version don’t talk to each other. I wasnt keen on it myself, although it did drive a bit of traffic my way, but nothing to shout about. It worked great for me, but stopped cold when they updated the app. Hopefully it’s something you can make use of. Wow! I never heard of Flipboard before. Thanks for sharing, Craig, as always! Hope it’s useful for you. It’s great. Thanks for sharing. I have had a flipboard account for quite a while but as everyone has said- there’s so much else to read and do. However- you have inspired me to start flipping. Or flip-flopping. I will look for Entertaining Stories. Thanks- you made my day! I’m going to try this on my Kindle, see if I can get it to work there as opposed to my computer. I would think it would work just fine. Still finding my way around on there, so its a WIP, lol. You’re welcome. Glad it intrigues you. Never tried it though the name crossed my path several times. It’s another time consuming thing, I fear. With Pinterest, Triberr, Linkedin , two blogs to attend to, and so on and so on…..Yet, if you say it is interesting I might give it a try some day. Thanks for sharing! Not bad at all, Carmen. Copy and paste, then walk away. I’m finding it very similar to Pinterest, but kind of more professionally-oriented. Now that Craig has explained it, I’ve been playing around with it this morning and I have to say, I rather like it. This is an awesome post. I can’t wait to dive in and create my own magazine on Flipboard. I’ve been using it for a while to track articles and subjects that interest me, but had no idea I could have my own space out there too. Thanks for sharing this! I like it, because it doesn’t require a lot of maintenance. I enjoy being social, but it’s nice to have one that doesn’t require a lot of babysitting. Today’s featured post on Story Empire! This is something I may have to try. I use Paper.ly in much the same way but I’ve never seen those kinds of results. Thanks for the excellent tips! P.S., I reblogged this, should have mentioned that. NOW I get it. Thank you, Craig. Great post. Thought I’d share this. 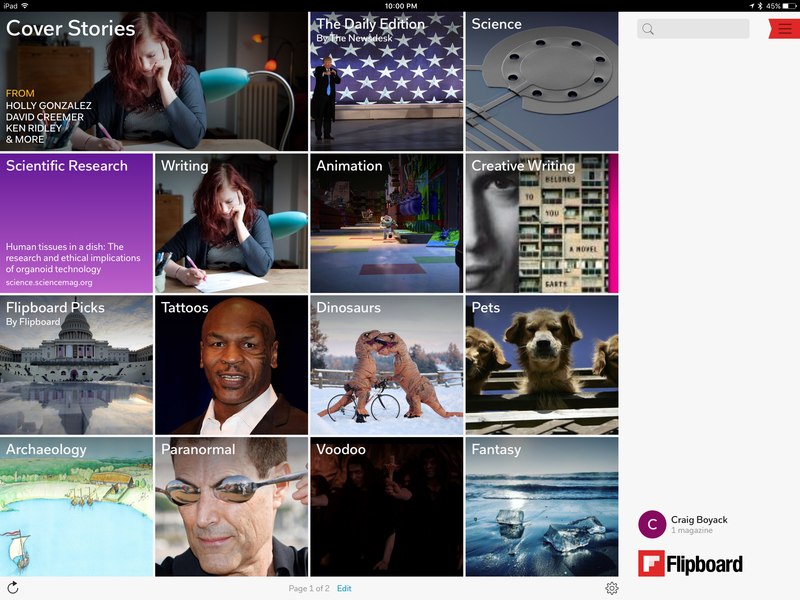 Flipboard is something new, in case anyone wants to try it and make their own magazine. Thank you Chris. I’m sure it would help for those formats, but it’s been pretty useful for me too. I’ve never heard of Flipboard. Thanks for sharing. I’m going to try to find your short story writing trick. Must have been a doozy! Thanks so much for this! I reblogged it, too. I love writing short stories, and your barrel story is WONDERFUL! Thank you. I’d forgotten that I included it there. Glad you enjoyed it. I didn’t see the point in replying to a post that old, but I have to say your 50 Gallon Drum story and post are excellent. Very well done, Craig. Thanks, Staci. That one caught Flipboard’s attention. Author C. S. Boyack speaks to the Story Empire crowd about Flipboard and its use as a marketing tool for writers. I’ve been waiting a long time for someone to explain Flipboard to me. Whether you’re new to it or just wanting to use it more effectively, you should check out this post. Are you using Flipboard? If not, maybe you should give it a try. I’m going to. Check out Craig’s informative post. I had never heard of Flipboard, either, and really welcome the information, Craig. I’m editing my latest book, and looking for all the marketing strategies I can find, hoping to have several new ones in place by the time I launch the book. This sounds easy, and could be fun, too. Definitely checking it out! Reblogging this on The Write Stuff, too. Thanks! Thanks for sharing, and I hope Flipboard becomes a valuable tool for you. Until now, I’d never heard of Flipboard, but it sounds like it’s worth looking into. Thanks, Craig! Thanks, Teri. I like how easy it is, just copy and paste. It’s really pretty simple, and when it catches on it goes crazy. I set it up. How do I see my own magazine? Click the red flag, like in my photo. Look at your magazines, and you will see the option to create your own. I did but I can’t see mine. I mean I can add to it but can’t see what it looks like. Okay, now that you’ve added something, go back to the red flag and click on your profile. All your magazines will show. Click on the one you made, and you should be able to flip through it. Oh wait! It is there under a pencil (Mac) not a red flag. Some things will be different because I use an app. Several of you asked for a post about Flipboard. Lisa Burton and I are explaining it over at Story Empire today. Stop by and say hi. Thanks, Julie. You might search Entertaining Stories while you’re there. It’s pretty simple, and you don’t have to do much more that add content.